In hospital, the equipment used is one of the major aspect for the treatment of patients. The equipment used in the hospital impact the various activities in hospitals and is a critical factor defining the effectiveness of treatments. Moreover, it also influences the perception of patients and their treatment. Also, the home equipment market is witnessing a high growth rate owing to increasing incidence of chronic diseases such as respiratory disorder, cancer and kidney failure. Increase in ageing population, cost advantages, technological advancement, rise in disposable income of consumers, and rising healthcare expenditure are some of the factors propelling the growth for global home medical equipment Globally, increasing number of multi-specialty and super-specialty hospitals in developing nations such as, China, India, Brazil, and others, is the prime growth driver of hospital infrastructure lighting. Increase in ageing population, cost advantages, technological advancement, rise in disposable income of consumers are also major drivers for this market, especially in home care segment. However, the cost of installation of these equipment is high which may restraint the market. This report identifies the global healthcare equipment market size in for the year 2014-2016, and forecast of the same for year 2021. 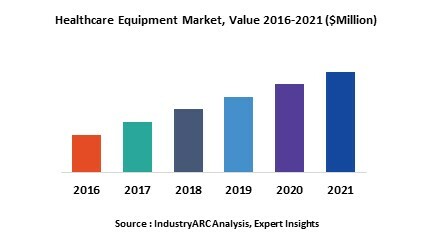 It also highlights the potential growth opportunities in the coming years, while also reviewing the market drivers, restraints, growth indicators, challenges, market dynamics, competitive landscape, and other key aspects with respect to Healthcare Equipment Market. Geographically North America dominated global healthcare equipment market, and Asia-Pacific is projected to have fastest growth, owing to investment in hospital infrastructure.